I saw this little story on itricks and I thought it was post worthy. I do not necessarily agree with the award but I look forward to see this season of Mindfreak. 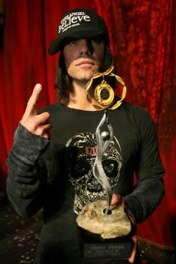 After racking up an extraordinary series of magic awards, Mindfreak magician Criss Angel, who stars in Cirque du Soleil’s Believe, has been presented with the ultimate prestigious title Magician of the Century. The award was presented to the Luxor headliner at the end of last night’s second Believe show. Robin didn’t specify which governing body awarded Criss the Magician of the Century award or why Criss had triggered the mercy rule only 10 years into the game. Meanwhile, we have some details on Mindfreak seasons 6, which is currently filming. One of the death-defying challenges Criss will face on Season 6 of Mindfreak will be the Grand Canyon death jump, and he posed for this exclusive photograph at the rim on one of his scouting trips there. He is plotting the mind-boggling adventure down to the scariest last detail before cameras roll in one continuous sequence.